Rose pruning ensures that plants grow vigorously and flower well each year. If left, climbing roses can become a tangled mess of branches with very few flowers. 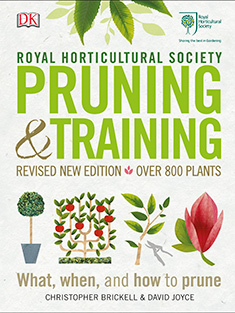 Although often considered complicated, rose pruning is not difficult if you follow this guide. Such plants fall into RHS Pruning group 17. Pruning a climbing rose growing on a wall. This method is suitable for climbing roses. Sometimes it can be hard to distinguish between a climbing rose and a rambling rose. The easiest way to tell the difference is to take note of the flowering time. A climbing rose will repeat-flower almost all summer and well into autumn, while a rambling rose usually flowers only once, normally around June. This method is also suitable for climbing roses (including miniature cultivars), Boursault, Noisette and climbing Bourbon roses. Climbers are routinely pruned in winter, after the flowers have faded, between December and February. Long whippy shoots can be shortened or tied in during autumn, to prevent strong winds from damaging them. Renovation can be carried out at any time between late autumn and late winter. It is easier to see what you are doing when the rose is not in leaf, plus there is a better response from the rose, which should grow back vigorously the following spring. Climbing roses are not self-clinging and need supports of trellis or horizontal wires to which the shoots can be tied. Blindness (lack of flowering) is another common problem with roses.